29th February,2012. 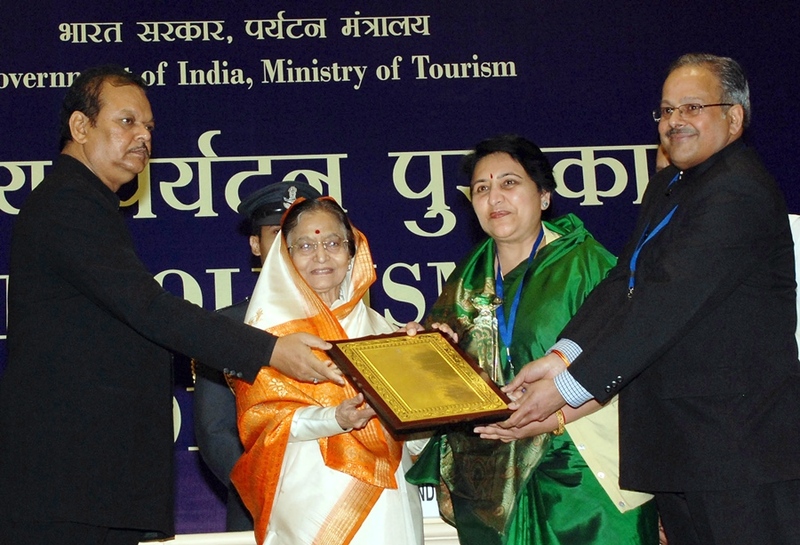 President Mrs Pratibha Patil today presented National Tourism award to Himachal Pradesh in a function held in Vigyan Bhawan, New Delhi. Principal Secretary Tourism Mrs Manisha Nanda and Director Tourism Dr Arun Kumar jointly received the prestigious award from President Mrs Pratibha Patil in presence of union Tourism Minister Sh. Subodh Kant Sahay and top officials of Govt. of India. Himachal Pradesh has been awarded the top prize for excellent promotion publicity material, said Director Tourism Dr Arun Sharma and added that last year the Deptt. brought out the first coffee table “Har Ghar Kuchh Kehta”,a book narrating the historical anecdotes associated with the summer capital of the Raj, Shimla,the queen of hills. The book has resulted in enrichment of tourism product,tourists are staying for longer durations and coffee table book has captured the magnificence of state. Himachal became the first state to launch the electronic brochure in the Contry he added. He said that Tourism Deptt. has been rewarded for various stuperndous efforts which has seen the contribution of tourism to the total GDP go up to 10 percent in the state Each building apart from having unique architecture ,which is a blend of classical goethic and hill architecture presents a rare blend of even Rajsthani architrctue. Stories about Shimla called from the local residents resulted in total involvement of stakeholders,stories became a fulcrum of the rural tourism flagship programme launched subsequently. Har Gaon ki kahani is an unique rural tourism initiative in which stories sent by villagers are developed by dove tailing. The tourism infrastructure in the state is being also developed through MNREGA to create various basic facilities to the tourists . Dr Arun Kumar said that The National Tourism Award is a recognition of the efforts state is putting in to become the most favorite destination in the country to fulfill the motto of Unforgettable Himachal for all seasons and for all reasons.